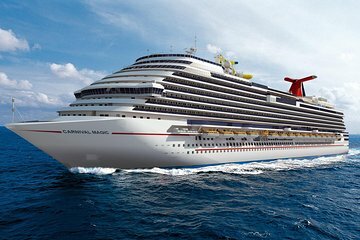 Need a cruise ship transfer in the Cape Canaveral area? Forget the long lines associated with finding transportation to or from the Port Canaveral arrivals and departures. Skip the taxis and shuttles and travel with confidence by scheduling for a shared vehicle. Climb aboard a 10- or 15-passenger van, then sit back and relax on the road to or from the cruise port to Orlando International Airport (MCO), Orlando airport hotels, Port Canaveral terminals and select Cocoa Beach hotels. Pickup is available from Orlando International Airport (MCO) and select Orlando Airport and Cocoa Beach hotels. Drop-off is available to Orlando International Airport (MCO) and select Orlando Airport hotels. This trip was by far the worst I have experienced with Viator. First my confirmation email said my trip was not confirmed until I called them 48 hours before going. When I tried to the number would ring and ring and ring for up to 8 minutes then disconnect. I tried this 3 times for many minutes. I went back to the Viator website and after much searching found a support phone number where the support person very helpfully contacted them with another contact number. He then got very condescending to me about not being able to connect. Seriously? The Viator person was on the line as i asked her to help and know how ridiculous this set up was. He agreed this phone call was my confirmation. Once I landed at my destination I call them, as instructed and they told me I couldn't get my ride for another hour! Ok, what you going to do, it was already paid for. So after an hour sitting at the airport the driver called me to say he was there and waiting. I asked his location to find him and it was the opposite side of the airport. If I had been told this while I sat waiting for an hour it might have helped my stress level and the drivers putting up with my 3 phone calls trying to find him. The driver was helpful and curious. On the return trip I again was bounced around to get back to the airport. I was hopped to my second shuttle and finally taken to the airport just in time for my flight which they asked at my confirmation. The lady who drove me back said she was doing so because she said she hated the guy who set up the ride because he NEVER comes to get his people! Not great to hear. All in all I did get my rides but with a lot of stress and crabby people. Like I said, Viator has always been great, but this farm out of services needs to be looked at a bit harder. At least in Orlando. Our pick up from Orlando airport to the cruise port was fine BUT our pick up when we returned from our cruise was terrible. There were 4 of us ladies. We chose the earliest time to get off the ship which was 9am but the ship's disembarkation procedure was horrible! It was not our fault that we got off so late! The guy from the tour called me at around 935am and asked me where we were. I explained to him what happened. He was rude! He said that I signed up for 930am pick up, the driver is already waiting and we weren't there. I pleaded for him to be patient but he hung up on me. We finally got done and out of the terminal @1030. Since we already missed our pick up time, we took a taxi to the airport and paid 30 each! I received a call again @ noon and he identified himself as our driver and that he was at the cruise terminal. I told him, he was too late. That was 2 1/2 hrs later! Nobody called me again between 0935 and 12pm to let us know they are sending us a different driver! I figured they already got paid, so they don't care! Never again! I'll take the cruise line's transfer next cruise. My initial experience wasn't good. The directions given in the welcome email were to call the supplier at least 48 hours prior to departure. When I called, I was told the system was down and to call back. I called the next day and was told my name wasn't showing and to call back. The next time I called, which was the day of my travel, I was finally given a pick up time. Not good. However, once I was picked up, the driver was friendly and provided exceptional service to the port. Our incoming plane was delayed and so our times were all changed. We did not end up using the transfer to the ship because we couldn't confirm that they would be there on time and waiting for us and we had a very narrow time frame in which to get to the port. The individual I spoke to on the phone was not helpful and was very hard to understand and it didn't seem that he understood the problem and the seriousness of the situation. We did use them on the return trip from Port Canaveral and the service was good. The vehicle was clean and we didn't have to wait too long from our scheduled pick up time. On time service, easy to locate, and great staff. dependable. Give yourself EXTRA TIME to allow for them to show up. They had booked same driver for a 11:00 and 12:00 pick up. Luckily we were able to be together. He was late for the 11:00, and the people arrived early for the 12:00.